As our demonstration projects are moving forward, I’m learning a lot. We immediately discovered ways to improve what we’re doing. Equally, we’re discovering how quickly other elements of our innovation come into play. One of those is the Citizen Jury. As explained in the link, the Citizen Jury is the process citizens help the payer organization make subjective decisions needed to fine tune the Copiosis algorithm so it reflects community values. 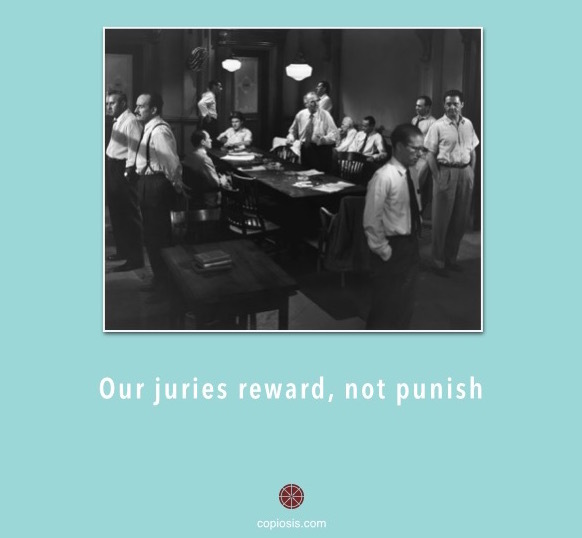 Our Citizen Juries are similar to a grand jury. Rather than determining if a trial should proceed, Citizen Juries listen to expert testimony from researchers, statisticians, scientists, technicians, consumers, and producers offering relevant information and experience to the issue under review. Jury members are selected, brought together, and oriented to their role. They listen to expert testimony, ask questions, and make their ruling, then pass the ruling to the payer organization, which the payer organization codifies into the variables for the next period. I had the pleasure of testing this process out in November. It was the first test of its kind. Here is the full text from the ruling paper, published in early November 2015. The jury convened to rule on several questions related to a holistic practice called Reiki, which is currently being offered in the Chico Demonstration Project. Reiki is a form of alternative medicine developed in 1922. Reiki is often judged to be pseudoscience by the medical community, and there may be capitalist-driven conflicts of interest at work affecting these conclusions. Questions posed to the Jury helped determine algorithm values for Po and Sh. The Jury ruled to use the Coefficient of the Consumer Benefit Expression to amplify PS , as the ultimate arbiter of Reiki’s effectiveness rests with the consumer. Since its beginning, Reiki has been adapted across varying cultural traditions. It uses a technique commonly called palm healing or hands-on-healing. Through the use of this technique, practitioners believe they are transferring “universal energy” through the palms of the practitioner, which they believe encourages healing. Developed in 1922, Reiki is a Japanese technique for stress reduction and relaxation that also promotes healing. It is administered by “laying on hands” and is based on the idea that an unseen “life force energy” flows through us and is what causes us to be alive. If one’s “life-force energy” is low, then we are more likely to get sick or feel stress, and if it is high, we are more capable of being happy and healthy. Reiki is considered pseudoscience by some in “mainstream” medical and psychiatric communities. It is based on qi (“chi”), which practitioners say is a universal life force, although there is no empirical evidence (yet) that such a life force exists. Surveys of the clinical research do not show Reiki to be effective as a medical treatment. The American Cancer Society, Cancer Research UK, and the National Center for Complementary and Integrative Health state that Reiki should not be a replacement for conventional treatment of diseases such as cancer, but that it may be used as a supplement to standard medical treatment, and many hospitals, including Enloe Hospital in Chico, have chosen to included the practice in their treatment offerings. We convened our first Citizen Jury to determine certain variables so that they reflect cultural and social norms in the demonstration project community. Jury members were all supportive of Reiki as a practice. The Payer Organization member is agnostic of the practice. The jury process was far more informal than that of an actual Citizen Jury. It reflects the informal nature of the demonstration projects. What is does current research on Reiki indicate? What can be deduced from that research? What should the value of Po be for the algorithm as it determines NBR for producers delivering Reiki to people? What should be the value of Sh be for the algorithm as it determines NBR for producers delivering Reiki to people? What else should be considered, if anything? Question One: What is the opinion of current research on Reiki? The jury decided that personal and professional biases and institutional self-interest on both sides of the issue probably affect the value and validity of research currently available. The conflicts of interest inherent in capitalist society makes it difficult to trust research studies, as well as expert opinion. Jury members concluded therefore that the ultimate arbiter of the value should be the consumer, the person receiving the treatment. Question Two: So what is Reiki’s value? The Jury decided any value for both variables should be greater than zero as there is no known harm from providing Reiki. Question three: What should the value of PO be in the algorithm as it determines NBR for providers of Reiki? Po is the consumer-benefit variable. It exists in the algorithm to reward producers for the benefits a product or service provides an individual consumer. The jury decided that, since no objective benefits can be determined, due to the inherent biases in current research, this value should be set to the lowest possible value without penalizing the producer. Therefore, the value was set to 1. Question four: What should the value of Sh be in the algorithm as it determines NBR for providers of Reiki? Sh is the Human Impact Variable. It exists to reward producers for benefits that accrue to society as a whole, making it more resilient. The jury found it difficult to make a case for Reiki producing a more resilient society. It therefore set the Sh variable to 1. Question five: What else should be considered, if anything? Since the jury decided that the final arbiter is the person receiving the benefit, they agreed that the best way to reward the practitioner was to use one of the fine-tuning variables to amplify the subjective benefit (PS) reported by the consumer. The jury therefore decided to use the Coefficient of the Consumer Benefit variable to amplify both the Objective and Subjective benefit. However, with PO set to 1, the Coefficient will have the effect of only amplifying PS. Part of this first project’s purpose is to examine how the algorithm functions as it awards NBR. We don’t fully understand the variability of NBR awards for given transactions yet, so the jury decided to set the CCB arbitrarily at 5. This means the subjective benefit reported by the consumer has five-times as much weight as it would ordinarily. We will use this example to learn how to improve the algorithm in the future. For more information about how the algorithm works, please see the document Net Benefit Calculation Algorithm Proposal V6.0, which is available at the Copiosis Group Facebook Page. As you can see, we’re not trying to run these juries as they would be in a formal setting. We’re trying to understand our innovation as it works with ordinary folks, and we look forward to learning more.